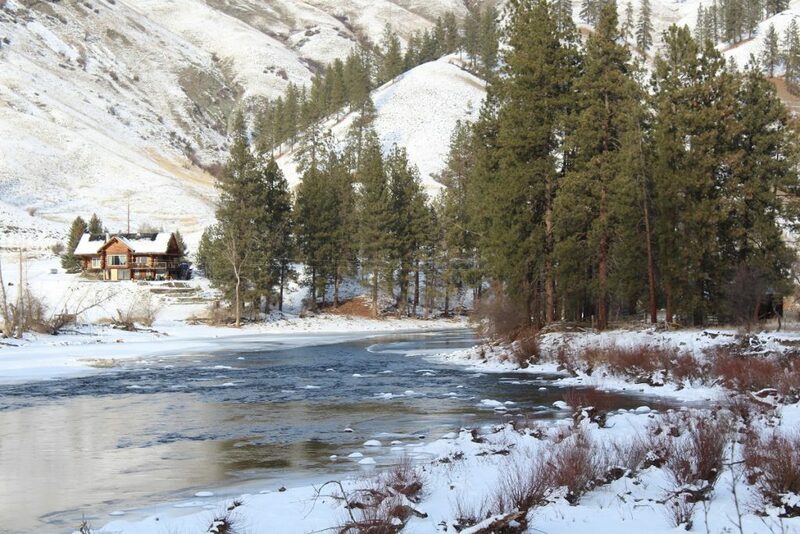 We are blessed to have the lovely Kettle River flowing through the Back of the Beyond in Ferry County, Washington. 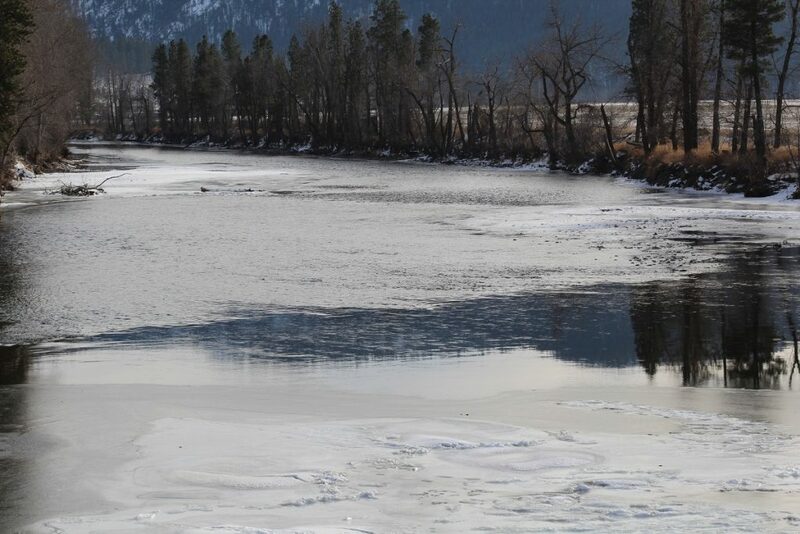 This river is a bit of an anomaly as it flows down from Canada then makes a u-turn to head back into British Columbia, runs along side the US-Canadian Border for a short while before crossing back into Ferry County where it enters into the mighty Columbia River. Right now, it is flowing quietly and peacefully and the trees are mirrored in its waters. 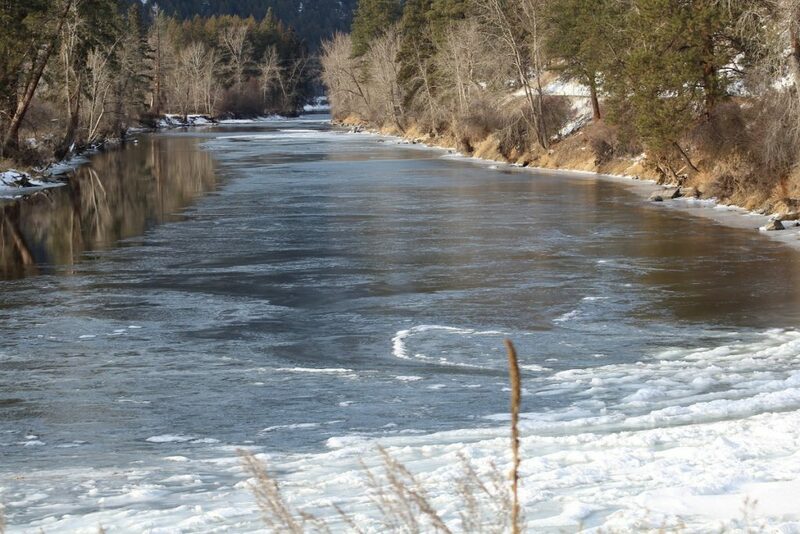 But come Spring, when the snow pack melts on our huge mountains, this river becomes a raging torrent. Per Wikipedia, the Kettle is a 175 mile tributary of the Columbia River . Its source is the outlet of Holmes Lake in British Columbia. Flowing south, it enters the USA at the tiny border community of Midway, BC. It continues on its way to Curlew, Washington which is 10 miles from our house. 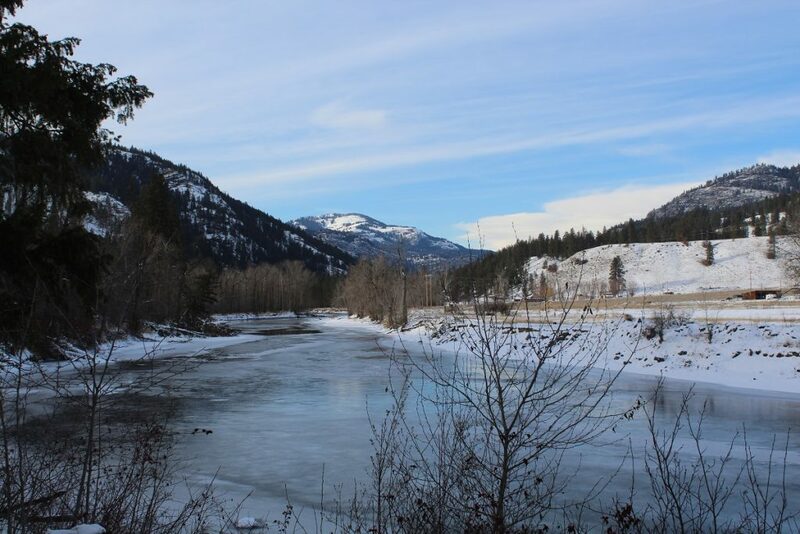 At Curlew, the Kettle River makes a U-turn and flows back into British Columbia at Grand Forks, a lovely town just 25 miles from where we live. 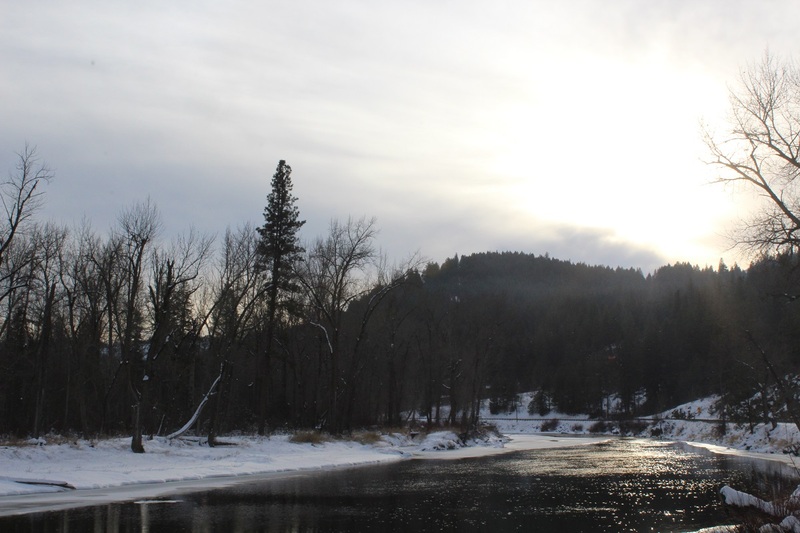 Last year, this “placid” river was inundated with the spring mountain runoff and the entire town of Grand Forks was under flood water. They are still struggling to recover. Flowing east for about 10 miles, the river turns south again near Christina Lake and enters the United States at Orient, Washington. 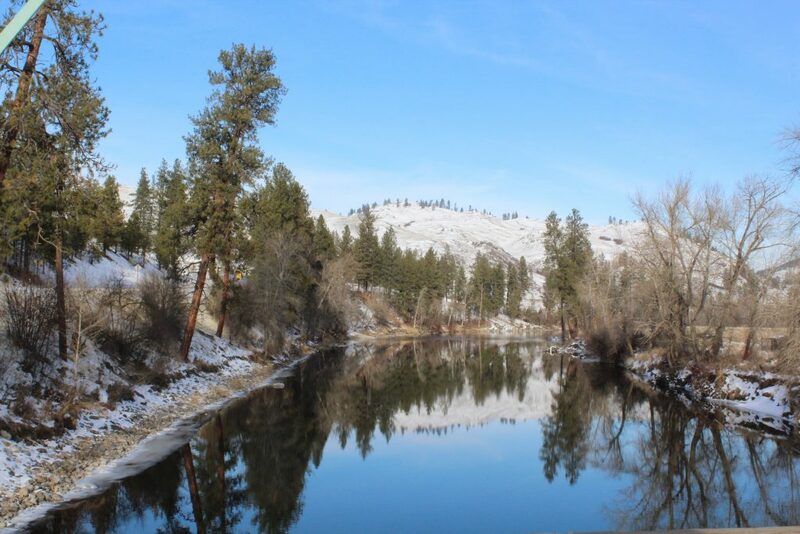 From there, the Kettle continues on its way to the Columbia River, entering it at Kettle Falls, Washington. I hope you enjoy my Winters’ journey along the beautiful Kettle River. This could be a post card! 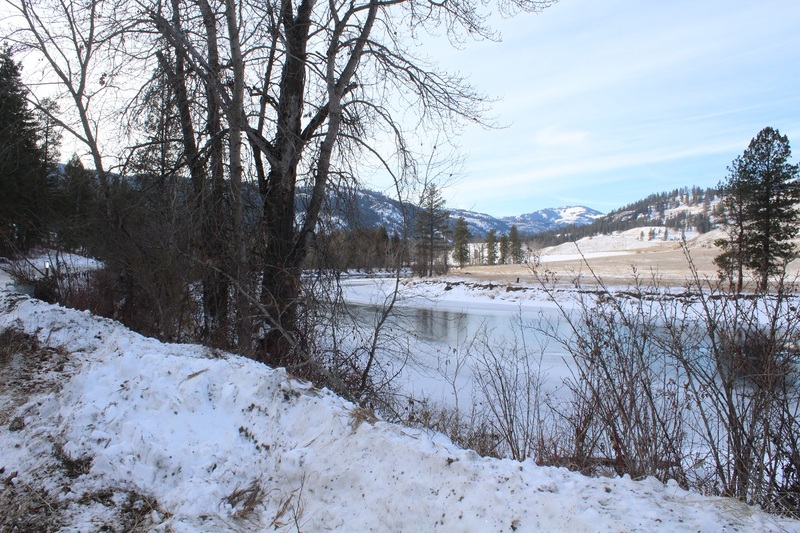 Ranchers on either side of the river, grow hay for their cattle. Off in the distance are a few of the mountains where the Spring runoff starts. 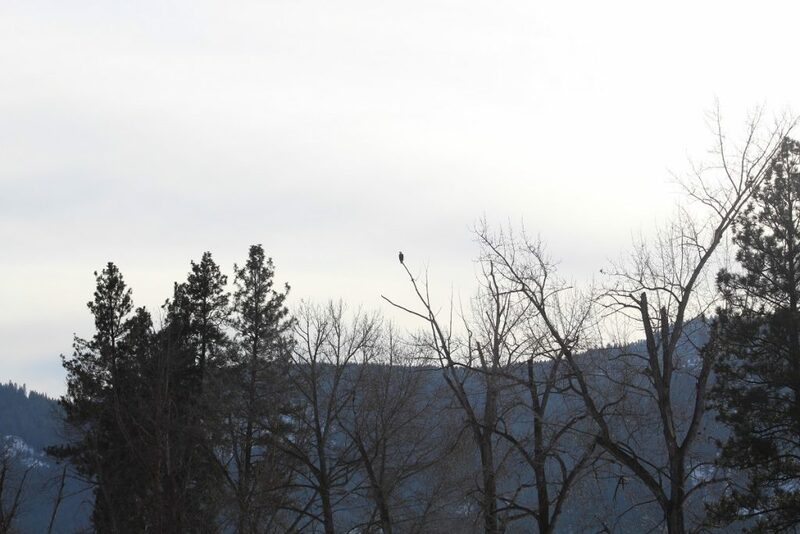 Last Fall, I spied this Bald Eagle perched high in a tree. 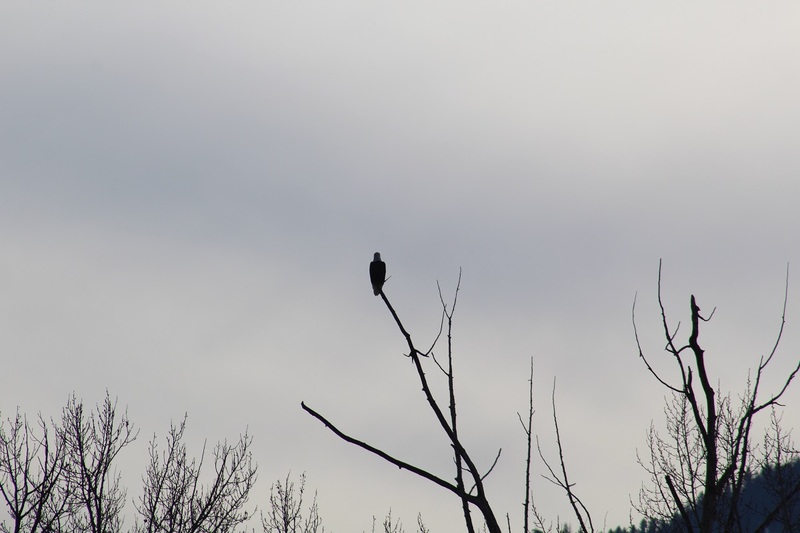 Today, I looked up and there he was again! I guess that’s his territory. High up in the tallest tree looking for a meal. Ripples as she flows over the rocky bottom. 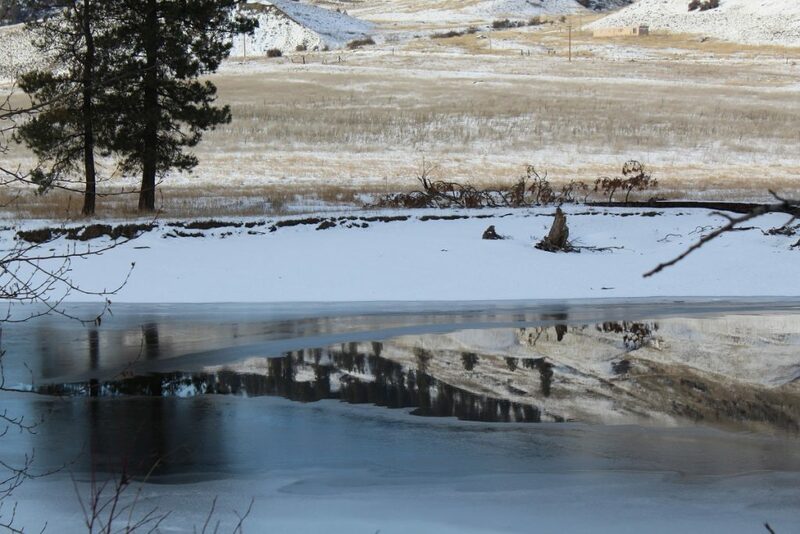 Ice is beginning to form. View from the Midway Bridge looking north. 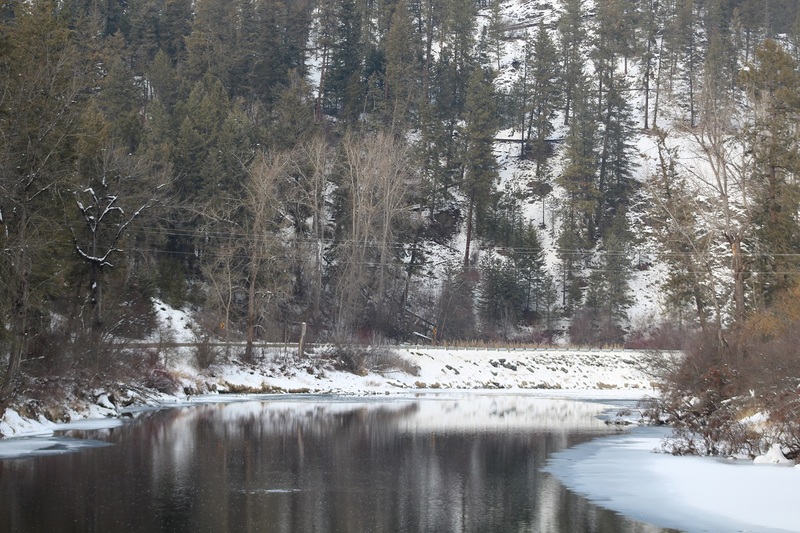 The Kettle River Road runs alongside the river. 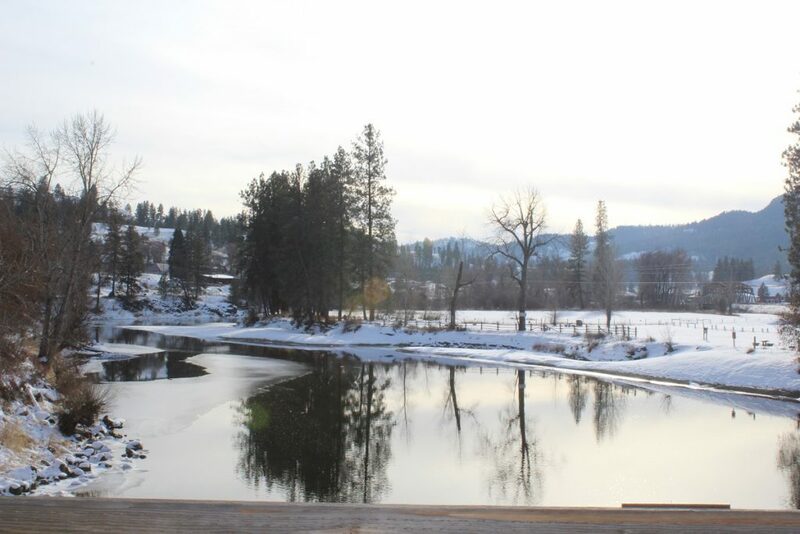 From Curlew, our river flows north to Danville where she crosses over into Grand Forks, BC. Not a photo of the river but I liked these cows I saw munching on hay on the road across from the Kettle. We loose our daylight early up here as the sun slips behind the mountains. So this is one last picture from this pretty day journey along the Kettle River. 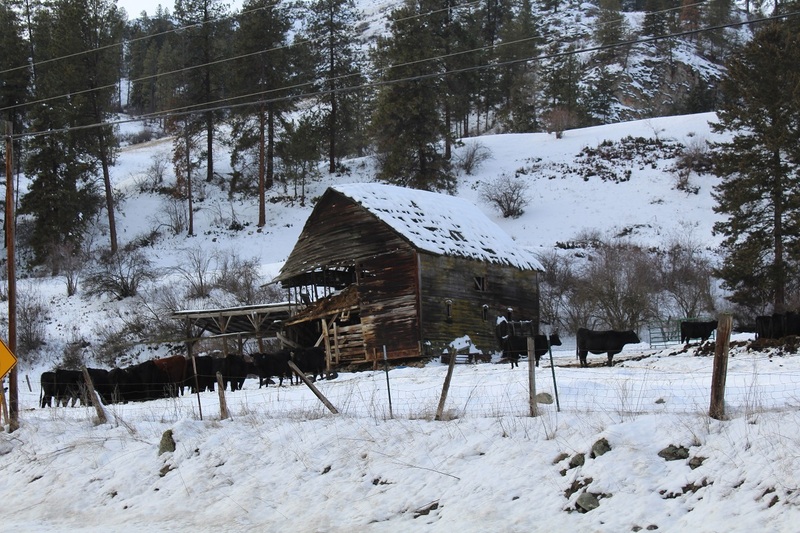 Winter may be long and harsh up here in the Back of the Beyond in Ferry County, Washington, but we are truly blessed to have magnificent scenery. Journeys do not need to be long or far away. Sometimes the best journeys start in our own back yards. For me, just being open to adventure is where it all starts. There is much to see and do here just by being willing to step outside and look. ” Look” is a magic word. Just “look” and you will find! Thanks for stopping by today my friends. Until next time, Journey on! As usual, I loved you posting! You REALLY bring the reader with you into your story. I would love to see them all together in a book. They are wonderful! This was fabulous. Loved your writing as always and loved the photos. So breathtaking.